Make your followers as green as the luscious Tegalalang Rice Terraces with this photo-worthy day tour. 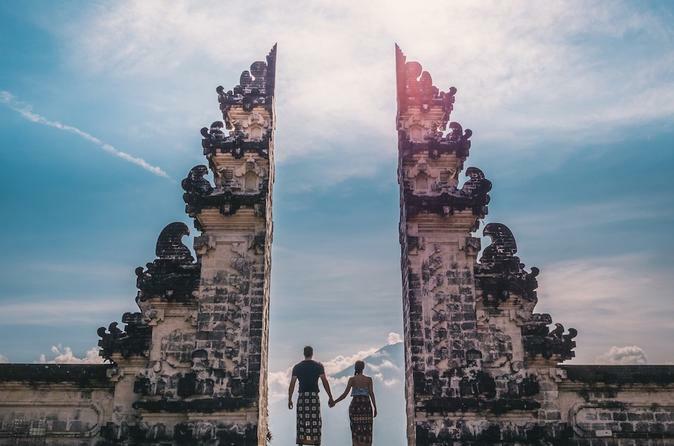 Journeying to five of Bali’s most Instagrammable destinations, you’ll love this trip whether you’re a blogger, vlogger or simply a lover of gorgeous scenery and Balinese temples. The tour will begin with an early morning pick-up from your accommodation and, depending on you, a little more snoozing as we journey to our first attraction of the day. Have your camera at the ready because as soon as we pull up at Lempuyang Temple you’ll be blown away by its beauty. Known as the ‘Gates of Heaven’, these mesmerising pillars are reflected in the water below them. Lempuyang is one of the oldest temples on the island of Bali yet it could have been built for photo opportunities with its incredible details and backdrop of Mount Agung. While you’ll want to marvel at it all day, three equally photo-worthy stops await. We’ll continue to the Tirta Gangga Magical Water Palace where stone lily pads connect the incredible temple structures. After a stop at Cepung Waterfall where you’re bound to get more incredible footage, we’ll finish the day at the Tegalalang Rice Terraces. These rolling rice terraces reach as far as the eye can see. The only thing more ‘grammable will be the shot you get on the famous jungle swing. Other Instagrammers might as well give up after they see your photos from the day!